The Falcon 9 Rocket and Dragon Spacecraft: See the craft in detail, plus how it stacks up to a Russian Soyuz rocket and NASA's space shuttles. NASA's spaceshuttles are flying their final missions this year, but one commercialspaceflight company in California has a new, privately-built rocket standingready to replace the aging workhorse. SpaceExploration Technologies? (SpaceX) new Falcon 9 rocket is already assembled inCape Canaveral, Fla. for a debut in the first half of 2010. A following flight,sometime between May and November, would launch the cargo-carrying Dragonspacecraft to resupply the International Space Station. 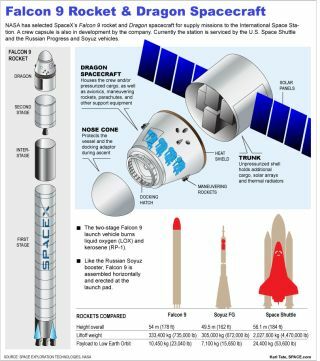 Dragon couldalso eventually loft NASA astronauts into space by as early as 2014. Just don'tcall it a taxi service, said Gwynne Shotwell, president of SpaceX. The company,founded by PayPal entrepreneur Elon Musk, has already launched satellites toorbit on its smaller, unmanned Falcon 1 rockets. "Elonstarted this company with the hopes of making space more accessible forprofessional crews ? not necessarily joy-riders or tourists ? and really tofacilitate the manned exploration of space," Shotwell told SPACE.com. NASA'sproposed 2011 budget request would scrap its new spacecraft plans and, instead,set aside about $6 billion over the next five years to support commercialspaceflight. That marks a major shift toward using private companies suchas SpaceX to launch both cargo and humans into low Earth orbit. SpaceXalready holds a $1.6 billion contract with NASA for 12 flights to resupply thespace station. Another company, Virginia-based Orbital Sciences, is building anew Taurus 2 rocket to launch its own cargo ship to the space station for NASAunder a $1.9 billion contract for eight flights. ?One of themost exciting things, to me, about the 2011 NASA budget is that it acknowledgesone of the biggest barriers to exploring space, and that barrier is how do youpay for it,? said former NASA astronaut Ken Bowersox, who is now SpaceX?s vicepresident for astronaut safety, during a Feb. 2 NASA event in Washington, D.C.
Bowersoxsaid it is up to NASA and the government to set new destinations in space.Private companies like SpaceX have to figure out how to get there. ?It?s areally great thing to watch what happens when you blend the skills that areonly available in the government with the flexibility and creativity of privateindustry,? Bowersox said. Still,SpaceX has not sugar-coated the challenges of launching a brand new rocket. The company enduredrepeated heartbreak with three failed launches of its smaller Falcon 1 rocketbeginning in 2006, but finally tastedsuccess during the fourth launch in September 2008. A fifthcommercial launch in July 2009 marked two clean launches in a row, or whatShotwell deemed a "critical milestone" for the company. She addedthat the people at SpaceX remain "stubborn" and "tenacious"even as they acknowledge the challenges that lay ahead. "Historyshows that the first two flights of any vehicle is a struggle," Shotwellsaid. "We're certainly not rushing to the flight line." For Falcon9, SpaceX has taken painstaking steps to get it right the first time. The two-stagerocket stands 180 feet (55 meters) tall and is capable of hauling spacecraft orpayloads weighing up to 23,000 pounds (10,450 kg) to low-Earth orbit. SpaceXhas designs for a heavy-lift version, which would use two additional boostersto launch payloads of up to 70,548 pounds (32,000 kg) to low-Earth orbit. The companybuilt the main components of two Falcon 9 vehicles just for qualification andpropulsion tests. That means the rocket slated for launch from Cape CanaveralAir Force Station in Florida actually represents the third Falcon 9 vehiclethat SpaceX has built. But all thecomputer simulations and firing tests on the ground can only go so far,Shotwell explained. Only launch day will show just how well a rocket's guidanceand control perform under actual flight conditions. SpaceX plansto launch many unmanned cargo flights with Falcon 9 and establish a safetyrecord before putting astronauts aboard. Yet it and other commercialspaceflight providers still face a numberof doubts from the U.S. Congress, as well as from supporters of thecancelled Constellation program. "We'renot talking about putting crew on the first Falcon 9 flight," Shotwellsaid. She added that the idea of commercial spaceflight being inherentlydangerous was "ludicrous," and pointed to commercial airlines asexamples of reliable private enterprises. Anindependent advisory panel also issued a January report that said privatecompanies do not meet NASA's crew-rating standards. Elon Musk,founder and CEO of SpaceX, countered by calling the Aerospace Safety AdvisoryPanel's findings"bizarre." He and Shotwell questioned how the panel came to itsconclusion after barely spending any time reviewing SpaceX's vehicles or data. "Commercialcompanies rely on the quality of their products and services to stay inbusiness, and quality for ISS missions clearly means safety andreliability," Shotwell noted. "We stay alive based on our trackrecord." NASA has notyet officially established safety standards to rate commercial vehicles thatwould carry astronauts into space, but it has shared some of its existingguidelines, NASA officials have said. SpaceX has adopted temporary guidelinesbased on those existing crew ratings in anticipation of the U.S. space agency'sdesires. "Wedon't anticipate that they'll make it any easier on us, and we don't want to betreated in a special way," Shotwell said. "We're designing the safestvehicle that we possibly can." Fiveastronauts have already undergone preliminary training with SpaceX's Dragonspacecraft, so that they know how to receive the unmanned Dragon during dockingoperations with the space station. But SpaceX has also prepared for the daywhen astronauts themselves will ride Dragon into space. The mainchange for making Dragon crew-ready involves adding a launch escape system forthe astronauts. Otherwise the spacecraft needs very few alterations to carryhumans versus cargo, Musk noted during the spaceindustry teleconference. "We'reconfident of being able to do it at $20 million per seat," Musk said. Bycontrast, a ride into orbit aboard the Russian Soyuz costs NASA approximately$51 million per person. NASA's newbudget also includes extending the space station's life until 2020 ? a prospectwelcomed by SpaceX. "Itcertainly provides a longer-lasting market for resupply activities,"Shotwell said. "On the other hand, I think that we've invested anincredible amount of money in the ISS, and we've forged important politicalrelationships in that process." For now,SpaceX is fully focused on fulfilling the first part of its Commercial OrbitalTransportation Services contract, which involves three Dragon flightdemonstrations. "For a$278 million investment on NASA's side, they're getting access to a brand newrocket and a Dragon spacecraft that can shuttle cargo," Shotwell said. "I can't imagine a better value for the dollar."